I've bought a tall old angle-poise lamp from a garage that's closing down. I'd guess it's 1920s/1930s, mainly cast iron, and is adjustable for height. Clearing off the gungy old oil and grease I found the name of "F.E.W. Multi Lamp", with "Model B" cast beneath it. It must be designed for garage use as it has two legs, plus a third that swings out to steady it when stood upright. You can also fold in the third leg and drop it down on its back, enabling it to run on castors (one is missing) and slide beneath a car being worked upon. I just wondered if anyone knew what the initials "F.E.W." might stand for, perhaps the firm only did lighting, or did a range of engineering/garage tools?? A quick look online didn't yield anything, but maybe it rings a bell with someone? I'll get a couple of photos uploaded when I get a mo. Found this reference, might point the way for further research. is now numbered as 215. Thanks Penman, that could well be the same company. There are references around to Audax (Langham) Limited, the company's activities are recorded as "Manufacture Of Telegraph And Telephone Apparatus And Equipment", although I have found a few lamps answering this description. F.E.W. is F. E. Waller of Langham, nr Colchester. 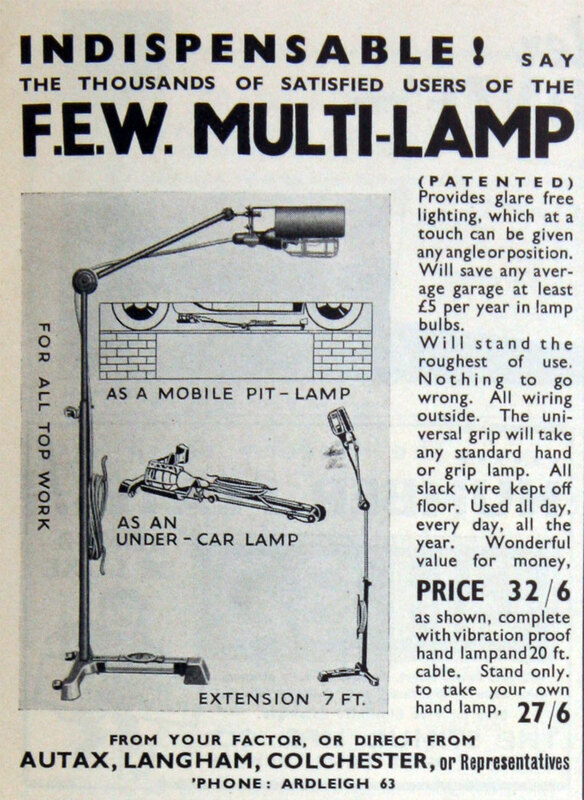 And the following advert illustrates a lamp very similar to mine, designed for use above and below a car. Mine has a fixed lamp on the top though, not a removable hand-held type. This tallies with the garage I got it from, as it was opened in 1939. It looks like it is the same company. If you click on the name link under Autax it gives a history mentioning patent valve-spring attachments which seem to be what my link was for.